The two South Asian countries are all set to be formally admitted into the organization at the upcoming SCO summit in Uzbekistan's capital Tashkent on June 23-24. 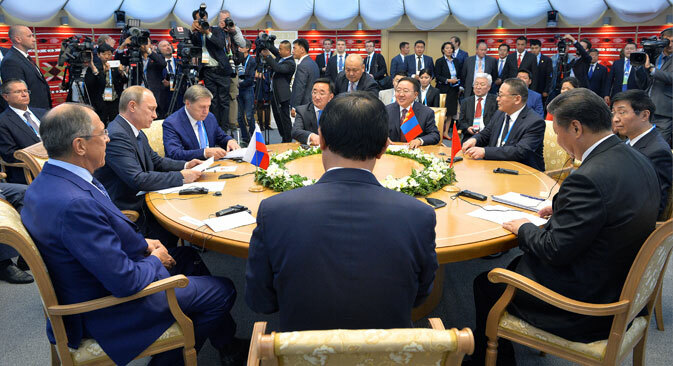 The fact that countries with different approaches to and views on international issues join the Shanghai Cooperation Organization (SCO) creates conditions for those issues to be resolved, Russian President Vladimir Putin said. "The international environment is complicated and multifaceted, and issues are not resolved by the mere fact that countries with different approaches to and views on various international challenges join our Organization. However, as we expect, their accession does create conditions for the issues to be resolved," he told the Chinese news agency Xinhua in an interview ahead of his visit to China. A decision to admit to the SCO another two states, India and Pakistan is due to be formalized at the SCO summit in Tashkent on June 23-24, the Russian head of state said. "We will also consider the intentions of other countries to join our work," he said. "Indeed, as the Shanghai Cooperation Organization expands its areas of operation and its membership through the participation of the powerful countries I have just mentioned, it turns into a very powerful international association that commands respect and is relevant both in the region and worldwide," Putin said. The SCO was initially created to address issues of border cooperation between its members, yet it "has become highly demanded and attractive in the region, and many countries of the world have expressed their willingness to join it," the Russian president said. Leaders of all SCO state members are expected to be present in Tashkent. It was reported earlier that Chinese President Xi Jinping, who will also take part in the SCO summit, has been in Uzbekistan since June 21. Afghan President Ashraf Ghani, Belarusian President Alexander Lukashenko, Mongolian President Tsakhiagiin Elbegdorj, Pakistani President Mamnoon Hussain, Indian Prime Minister Narendra Modi and Iranian Foreign Minister Javad Zarif will represent SCO observer states at the summit. This year is the 15 anniversary of the SCO that comprises China, Kazakhstan, Kyrgyzstan, Russia, Tajikistan and Uzbekistan. Observers in the organization are Afghanistan, Belarus, India, Iran, Mongolia and Pakistan, while Armenia, Azerbaijan, Cambodia, Nepal, Turkey and Sri Lanka are the SCO's dialog partners.